Yep, another frickin' "RUSTIC" mod...... deal with it. Comments and queries go here... Hopefully, the respectful and not annoying kind. If my Corgi will allow. Not that bad idea. Could need a nice retexture for the dogs. If someone makes a new wolf mesh with short legs, I might consider it. I make wolf legs shorter all the time , but I don't think that is what you meant? Right on! Another Gamwich Rustic mod. And yes, I will deal with it, by installing it. Edit down. Phone scroll laaag. It seems that I've lost control of my mod..... the world is spinning off its axis. I think I will try this.. if theres any better quality on the wall. 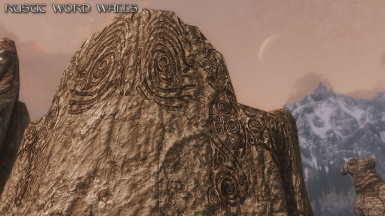 Do all your Retexture mods from regular skyrim work for sse? Because there are some here that i would love to have in my game. As long as they are just textures, and don't contain any meshes, then they should work OK. Textures will usually work fine, it's meshes that must be converted to work in SE. I was convinced of that until today. 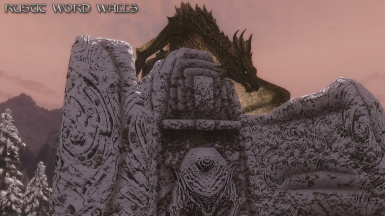 However, I can not learn a shout from the Dragonborn DLC with this mod. As soon as I removed it, I could learn it. No big deal, I just thought, I mention it here. A texture can't prevent you from learning a shout. There is no correlation between the two. I totally agree with you. I noticed it anyway and thought, I'll report it here briefly. I am somewhat familiar with the structures of modding and I can not explain how that comes about. 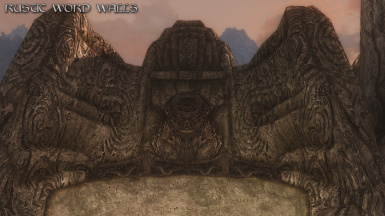 I only have one beef with this otherwise excellent mod: In-Game books describe the Walls as black in color. They weren't in vanilla but they are not black here, either. Would it be too much to ask if you could make a "black" version of the wall? Are they?..... Perhaps you could quote the lore passage. Well, I'd frankly like a bit more real evidence, before I go to the trouble of making an alternate version. Get back to me later with the info, if you have the time. 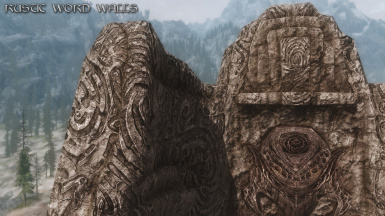 "Spread throughout Skyrim, in ancient dungeons, burial grounds, and other secluded places, there are walls. Black, ominous walls on which is written a script so old, so unknown, none who had encountered it could even begin its translation." "That sounds like nonsense, I know, but if you had stood by these walls - seen their blackness, felt their power - you would understand that of which I speak." Yes, it does sound more like they were originally meant to be obsidian, or whatever similar stone type existed in Skyrim. That would certainly have made them more distinctive in the game. 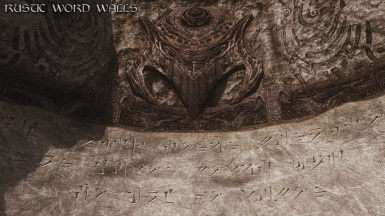 Of course, it also would've made the symbols much harder to make out in the dark dungeons. 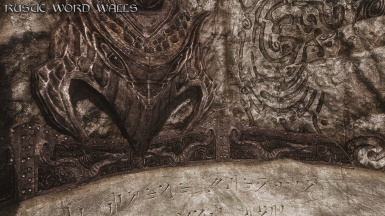 That may be why Bethesda didn't stick to the lore.... Or, the person responsible for the textures simply forgot that detail. I suppose I could work on a black version for those people who want a more lore accurate appearance. There's one issue that I forgot about.... the meshes use textures that are used by other dungeon areas in the game. 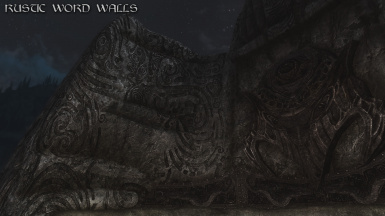 Therefore, a black version would make walls in the dungeons black as well. Therefore, it wouldn't really work with the vanilla game. 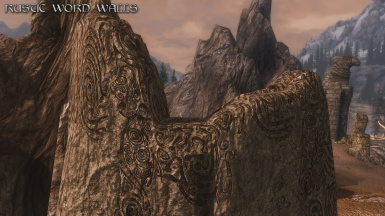 Unfortunately, Bethesda didn't make unique textures for the word walls. Well, obsidian can be really gray-ish.. 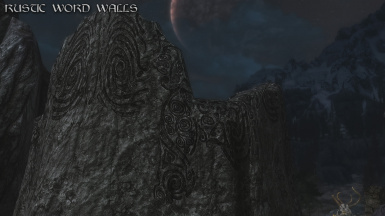 But the walls in skyrim are.. almost white.. Bathesta!? 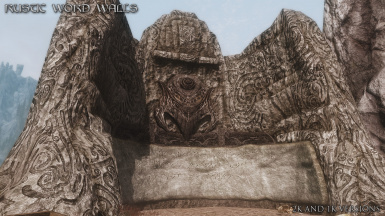 Does this work well with your Rustic Monuments and Tombstones mod? Or do I have to choose between them? They are totally separate mods, they have no overlap between them. 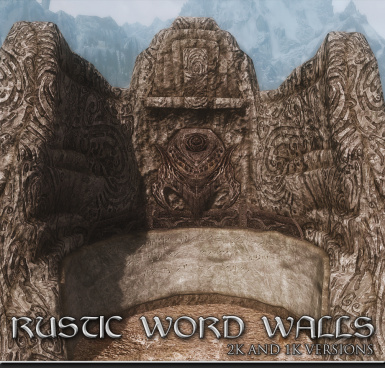 Rustic Word Walls only pertain to the dragon shout walls. 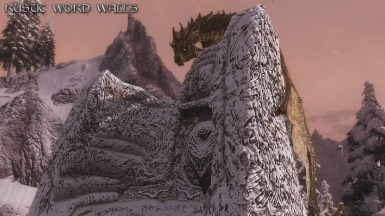 This play thru is the first time I noticed how terrible the first word wall looked in Bleak Falls Barrow-I installed this and the second wall I found, Bonestrewn Crest, was gorgeous-thanks! Thanks, I'm glad that my textures added to your game experience. Thanks Noz..... another nice review. after a while I decided to come here and say thanks for the incredible and detailed work...always a good mod by u! Now I just have to uncheck some other textures until I can get my new 980ti, because I love the Rustic textures, especially the amazing soul gem ones, and can't bear to uncheck any of them. Now turn all the mudcrabs into corgis. 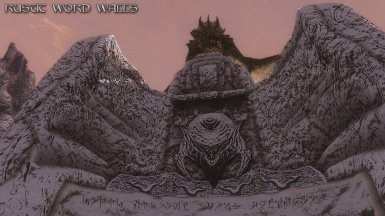 Another awesome re-texture, keep up the good work!